For the Ahmadi religious movement, see Ahmadiyya. 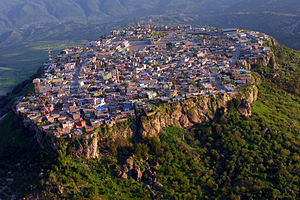 Amadiya (Kurdish: Amêdî, Arabic: اميدي‎, Amediyah), is a town along a tributary to the Great Zab in the Dahuk Governorate of Iraqi Kurdistan. The city is situated 4,600 feet (1,400 m) above sea level. The history of this city goes back at least to ancient Assyria, and was an Assyrian city known as Amedi from the 25th century BC until the end of the 7th century BC. Subsequent to this it was a part of Achaemenid Assyria, Seleucid Assyria, Assyria (Roman province) and Parthian and Sassanid ruled Assyria (Athura/Assuristan) until its dissolution in the mid 7th century AD. It has always been a strategic place as it is built on the flat top of a mountain. For several centuries, after the expulsion of the caliphs from Baghdad, it was ruled by a pasha, a prince who was from the royal Abbas family, reputed to be one of the richest rulers in the region. 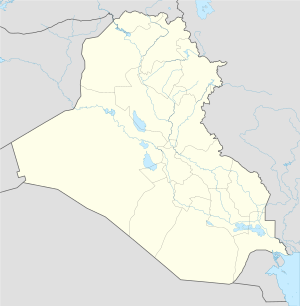 The region in which the city rests is also believed to have been the home of the Magi or priests of Persian-ruled Assyria. Amedia is believed to be the home of some of the most significant Magi priests, the Biblical Magi or the "Three Wise Men", who made a pilgrimage to Jerusalem to see Jesus Christ shortly after his birth. Amadiya was the birthplace of the pseudo-Messiah, David Alroy (fl. 1160). In 1163, according to Joseph ha-Kohen's "'Emeḳ ha-Baka", the Jewish population numbered about a thousand families and traded in gall-nuts. Alroy led a revolt against the city but was apparently defeated and killed in the process. The Spanish Jewish historian R. Schlomo Ibn Verga (1450–1525) portrayed the Jewish community of Amedia at the time of Alroy as wealthy and contented. Amedi was the seat of the semi-autonomous Badinan Emirate, which lasted from 1376 to 1843. At the turn of the 19th century, the population already numbered 6,000, of whom 2,500 were Kurds, 1,900 Jews and 1,600 Assyrians. There are ruins from the Assyrian era and ruins of a synagogue and a church in the small town. The town is perched on a mountain, formerly only accessible by a narrow stairway cut into the rock. Amedia has a well-integrated community of Christian Assyrians and Muslim Kurds that share the city and local social events. Although Amedia is just 10 1⁄2 miles (16.9 km) from the Turkish border across the Beshesh Mountains, the only border crossing into Turkey is now at Ibrahim Khalil border on the road Amedia - Dohuk - Zakho, 56 miles (90 km) away. There was formerly a border crossing at Habur. Proximity to the border means that at the current time, the Turkish army has an unofficial military presence within the town, despite being deep within the Autonomous Kurdish region of Iraq. The town is 1,100 yards (1,000 m) long and 550 yards (500 m) wide. It houses 6,000 citizens in almost 1,200 houses. ↑ Naval Intelligence Division (1944). Iraq and the Persian Gulf. Geographical Handbook Series. OCLC 1077604. ↑ Karen Dabrowska; Geoff Hann (2008). Iraq Then and Now: A Guide to the Country and Its People. Bradt Travel Guides. pp. 177–. ISBN 978-1-84162-243-9. ↑ Wright, George Newenham (1834). A New and Comprehensive gazetteer, Volume 1. T. Kelly. Retrieved 2009-09-12. ↑ "Jewish Encyclopedia". 1906. Retrieved 2009-09-12. ↑ Lenowitz, Harris (1906). The Jewish Messiahs: From the Galilee to Crown Heights. Retrieved 2009-09-12. ↑ "Catholic Encyclopaedia". Appleton. 1907. Retrieved 2009-09-12. This page was last modified on 17 April 2015, at 14:20.